Keeping your floors in a perfect condition at all times can be pretty tough, so why don’t you delegate the responsibility to our sanitation experts in Angel. Vetted and fully licensed, our technicians will take good care of your wooden and stone floors and make sure that all your needs are covered swiftly and on a price that is not going to put strain on your budget whatsoever. Feel free to get in touch with our friendly and very capable staff in order to learn more about our hard floor cleaning service in Angel. They use tested methods, state of the art equipment and eco-friendly detergents that are not going to let dangerous chemicals to enter your household. We would like to make one thing clear – we do not make any compromises with the quality of the service that we deliver. We are more than ready to go an extra mile in order to accommodate all your preferences and personal needs. After our experts are ready with cleaning your hard floors, they are going to refinish the wood if that is deemed necessary. The new coat of finish will not only make the floors look cleaner, but it will also prolong the life of the material. Our licensed and very experienced professional cleaners in Angel know everything about hardwood floors. Based on the exact type of wood that you have at home, they will choose the right method to remove stains and dirt and make them look as if the floors have just been installed. Pay as little as £2 per square metre with minimal order of £60. Our experts will come at a time that would be best fitted to your own personal needs and requirements. Feel free to get in touch with our friendly and helpful around the clock customer support in order to learn more about our services, as well as receive a free no obligation quote for the full price of the treatment that you hope to get from us. All prices are final, unless there is a change in the specs of the job at hand. No hidden charges and additional taxes upon completion of your hard floor cleaning. 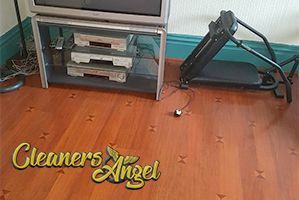 Over the years we have had the chance to work for domestic and commercial clients from all over town who have entrusted us with their hard floor cleaning in Angel. We have receive outstanding client reviews from every single one of them, praising our professionalism and care for the detail. If you want to join the large group of our happy customers, just give us a call now – it is indeed just easy as it sounds. We at Cleaners Angel will be more than happy to have the opportunity to work for you.